Traditional industries are changing under the influence of digital technologies, and none are changing as fast as retail. Global brands that have dominated the market for decades are under threat, undermined by the convenience and speed of online shopping. 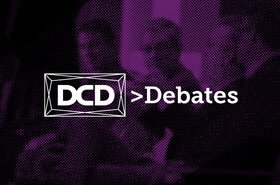 In the US, 2017 saw a record number of store closures – 6,885 shut their doors by the 1st of December (Deloitte), as giants like Macy’s, J.C.Penney and Sears shed unprofitable outlets. 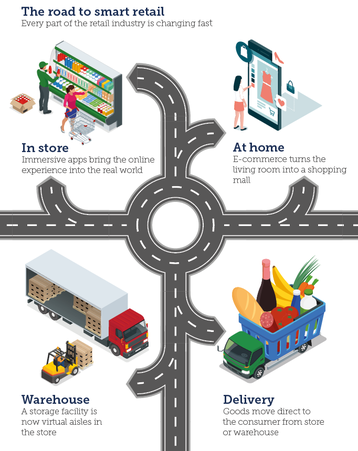 In the UK, a report from delivery specialist ParcelHero predicted that, by 2030, half of the country’s stores will have been swallowed by e-commerce and home delivery. At the same time, things aren’t looking all that great for online retailers either. The new nobility of the online world have to compete against the likes of Amazon and Alibaba. The former is busy making online shopping near-instantaneous; the latter is enabling customers to contact manufacturers directly, bypassing large swathes of the supply chain. In 2017, Amazon emerged as the third largest retailer in the world after Walmart and CVS (according to Forbes), while Alibaba was sixth. How fast are things changing? Walmart was founded in 1962 and CVS began in 1964. Three decades later, Amazon was established by Jeff Bezos in his garage in 1995, and last year brought in almost $178 billion in revenue. Alibaba was started by Jack Ma, a former English teacher, in 1999. In Deloitte’s list of the top five fastest-growing retailers, three don’t have any brick-and-mortar stores at all. China’s Vipshop and JD.com, and Germany’s Zalando only sell online, supported by shipping and warehousing networks. These brands are built to appeal to millennials - a generation that grew up with the Internet and smartphones. Millennials are killing entire industries, we are told. They don’t go to casual dining chains like Applebee’s (closing up to 135 restaurants), they don’t eat cereal or marmalade, don’t buy diamonds, drink less beer and more rosé, and watch Netflix instead of cable. Millenials are making new demands on the companies that supply them with products and services, and these demands have technology at their core. Technology is now essential to success in retail - providing the tools, business models, and new revenue streams that could save the household names.With analytics, online retailers can personalize the shopping experience and offer the most relevant products for each customer. With in-store customer tracking, store owners can count the number of people coming through the doors, and track each journey across the shop floor. ‘Proximity marketing’ can push a notification when a customer is near a target location. Augmented Reality creates a digital overlay for the physical world. In a retail environment, this can be used to guide the customer while pointing out special offers. Displays can boost sales by showing discounts or advertising. Touchscreens can add an interactive element, going further to replicate the online environment. Since they can’t beat websites on convenience, some physical stores are transforming to deliver shopping as an experience. Apple, one of the world’s most valuable companies, is a great example: all of its products can be purchased online, and yet its retail stores are among the most profitable on the planet. A lot of the success is down to architectural choices and interior design, but Apple stores also feature digital signage, incredibly dense Wi-Fi networking, solid power infrastructure that can keep hundreds of devices online, iPads serving as Point-of-Sale terminals and a single software platform running it all - not just one store, but the entire retail network. For Apple, retail stores are not a liability but a selling point, giving the brand a physical presence while its competitors remain virtual concepts. Whole Foods, now owned by Amazon, also trades in experiences - the design language invokes images of idyllic country life, but in fact the visual merchandizing is fine-tuned to appeal to millenials. It continues to attract customers despite its premium pricing on everyday items. To remain successful in this new world, many traditional retailers are turning to tools and skills that were previously the domain of IT companies. When Gap switched its operations to the cloud, it crafted a private platform to run its websites, using its own infrastructure, in-house expertise and popular open source tools. Gap now has control of its infrastructure. In 2017, its retail store sales shrank by 1.2 percent, while online sales grew 18.8 percent. E-commerce is now 20 percent of total revenue. Meanwhile, Marks & Spencer invested in its apps, its website and logistics, while closing 10 percent of its retail space. Other retailers use emerging technologies to try something completely different: British retailer Ocado started in 2000 as an online supermarket and evolved into a technology-based logistics company. Ocado has never owned a retail store - instead it designs and runs highly automated warehouses similar to those operated by Amazon. At first, the company created robots for internal use, but quickly realized it could make more money by selling this capability to competitors with larger shares of the market, who lagged behind in digital transformation. 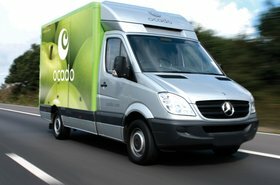 Today, major Ocado customers include Waitrose and Morrisons in the UK, Casino Group in France and Sobeys in Canada. In May 2018, a new deal with retail giant Kroger boosted its share price by 44 percent. Ocado is not a retailer, but a retail robotics specialist. In our own research, we found that retail giants have already introduced sensor systems to track operations, real-time inventory management and are using the cloud for data collected by IoT devices. Physical retail operations are less advanced, but are beginning to direct customer focus through customer tracking, demand analytics, and AI. Along with augmented reality, smart shelves, IoT and cloud services, this is the next wave of the retail revolution. Tech? A piece of cake! The relationship between computing and the retail industry goes back further than you might think. In fact, it goes back to the very first modern computer - the electronic delay storage automatic calculator (EDSAC). Developed by a team led by Sir Maurice Vincent Wilkes at the University of Cambridge in the UK in the late 1940s, EDSAC was inspired by the work of Hungarian scientist John von Neumann. It was the first stored program computer, with read-write memory. The EDSAC was programmed with punched-paper tape, and output to teleprinter. It processed 650 instructions per second – a marked improvement on mechanical calculators. It was first used by scientists, and three Nobel Prize laureates acknowledged it in their acceptance speeches. The project also had a commercial sponsor: J. Lyons and Co. – a British grocery company with a chain of tea shops, restaurants and hotels across London. Lyons was first to see how computers could reshape business. In 1951, the company received a return on its investment - a machine based on the EDSAC, called Lyons Electronic Office I, or simply LEO. Lyons promptly applied the system to track the value of the weekly output of bread and cakes from its bakeries, becoming the first company in the world to run a business application on an electronic computer – a fact recorded by the Guinness World Records. The company didn’t just refine the EDSAC design, it also wrote all of the necessary software from scratch. Later, the same machine was used for the more critical task of payroll automation. The experiment was so successful that, by 1954, Lyons formed LEO Computers Ltd to market LEO I and its successors to other companies. This family of machines changed ownership several times, but continued to serve business customers for nearly thirty years. This content was produced in association with Vertiv, as part of a larger eBook and research paper analyzing the state of mission critical IT in retail environments. For more, be sure to read the eBook here. Thank you for requesting your Ebook, you should receive an email shortly with a link to your report!